In the early 2000s, the Dunlop sports brand was being used once again (as it had in the past, as it is not at the time of this writing) for golf clubs in the U.S. market. And we got our hands on a Dunlop LoCo driver. It was quite a noticeable club, with its canary yellow shaft and navy blue clubhead. Later on, many golf manufacturers added bright splashes of color to their drivers, but at the time this club came to market - around 2003 - it was very unusual in that regard. Today, drivers aimed at recreational golfers are almost always maxed out at 460cc in clubhead size, but the LoCo fell just short of that. Still, it was quite oversized for its time, and its very closed face could make hitting good shots a challenge for golfers who didn't need that anti-slice approach. Here's a look back at our original review of the Dunlop LoCo driver. 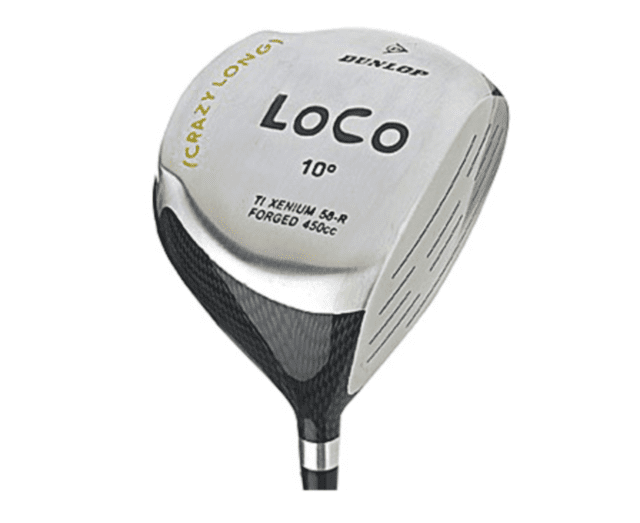 The Dunlop LoCo driver is a good option for high-handicappers and recreational players who want a premium-component driver without spending hundreds of dollars - but others will look elsewhere. Great price for premium-component driver. Closed face not a good fit for better players. The feel is a little heavy. Loud yellow shaft will be a turnoff for some. Huge clubhead comes in at 450cc. Head material is a forged aluminum, Ti-Xenium alloy. Face is closed at least several degrees to help those whose ball flight is a fade or slice. Harrison Striper shafts are standard and come in a bright yellow. Shafts are titanium-reinforced to help prevent massive head from twisting the shaft during swing. Soft, cushiony Winn grips are standard. It's certainly a striking club, with its bright yellow shaft and navy blue head. The yellow was a little too bright for my tastes - Dunlop was going for cool but didn't quite hit the mark. The LoCo driver is a game improvement club designed to help high-handicappers and recreational players improve their results. The huge head widens the sweet spot and helps on off-center hits; the closed face reduces the effects of over-the-top, inside-out swings. The club felt a little "heavy" in our testing - think of it as a "bonk" rather than a "ping." Still, with an MSRP of less than $150, it's priced for its market. Better players won't be big fans of the LoCo, and there aren't many customization options. Perfection Is Tough to Achieve: How Close Does The Perfect Club Come?